Buffalo’s Derek Suddons (7) breaks in for a scoring chance against Rochester. What looked like a dream regular season for the Buffalo Bandits several weeks ago has ended as a nightmare. The Bandits lost their eighth in a row on Saturday night, extending a franchise record for consecutive losses. The latest loss was a 16-14 decision to the Rochester Knighthawks before 19,070 in the First Niagara Center. Buffalo finished the regular season with an 8-10 record, so the team had a losing record for the third straight year – which has never happened before in team history. But the worst part of the late-season collapse is that the Bandits needed to win only more game to mathematically clinch a home game in the first round of the playoffs, and they lost them all. As a result, the Bandits will open the playoffs on Saturday in Toronto against the Rock. Toronto wrapped up second place in the National Lacrosse League East with a win over Minnesota Saturday night. “Ideally, you’d like to be going into the playoffs with some momentum. We’ll just have to take some things from this game,” Mark Steenhuis said. The sellout crowd that turned out for Fan Appreciation Night saw a game that couldn’t have been more different than the meeting between the same two teams last week. Rochester and Buffalo combined for only 12 goals in that one; they went past that number Saturday after a mere 21 minutes. The Bandits’ offense had its second-biggest night of the season with 14 goals. Steenhuis and Benesch led the way. Steenhuis finished with four goals and three assists, while Benesch contributed three goals and six assists for nine points. Joe Resetarits added five points, while John Tavares added four. “It’s amazing what happens when you stick to your game plan — when you move the ball, move your feet, move the ball and go to the net,” Benesch said. But at the other end of the field, Rochester was having even more success. Cody Jamieson needed two points to become the second player in the league to reach 100 points for the season. He finished with 10 points. Stephen Keogh and Craig Point added three goals and two assists each. Sid Smith even contributed his first career goal on a bizarre play at the end of the first half. Buffalo had pulled its goalie in the final seconds when Smith stole the ball in midfield, took a couple of steps to get free, and scored from about 90 feet. 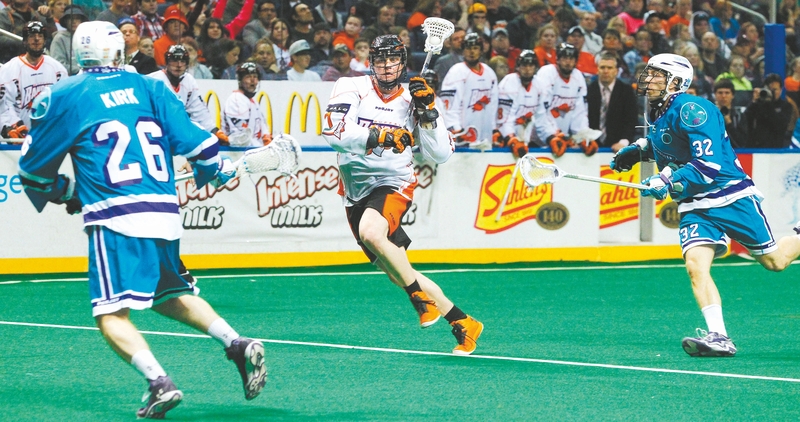 What’s more, the Knighthawks always had something in the tank when the Bandits went on a run. Buffalo never led in the entire game. The biggest moment of the game probably was early in the fourth quarter. With Point in the penalty box, Dan Dawson and Mike Kirk scored short-handed goals to turn a 12-11 thriller into a 14-11 Rochester lead. Buffalo scored the final three goals of the game to make it interesting, but couldn’t finish the job against the NLL East champions. The only silver lining in the Bandits’ finish is that, as of today, it doesn’t mean a thing. Turn the page, win some games, and all will be forgotten quickly. “That’s our job as coaches,” Cordingley said. “We need to do that. The biggest thing is that we have to play sound and smart lacrosse. I’ve said that for the last five, six weeks, but we’re not there yet. The Bandits went 2-1 against Toronto this season. But the Rock won the last matchup last weekend. They have won four in a row.